As with any esoteric interest, when you actively pursue the delights of motorcycling you find yourself developing a new cadre of social contacts. It’s an experience much like the one I enjoyed as a sailboat skipper in my decade afloat. Riding into the parking area at a motorcycle rally stirs fond memories of sailing into already populated anchorages on summer evenings. It carries with it the certainty that you’ll soon be eyebrow-deep in the close company of fellow enthusiasts, men and women of courage and curiosity, people of every age and status, and of every imaginable moral persuasion. The same is true of other gathering places for serious devotees of cycling or sailing … or flying or skiing or hot air ballooning. The eager faces I encounter at big commercial motorcycle shows wear the same engrossed–often mesmerized–expressions I saw in my years of attending sailboat shows all along the east coast. And the glint-eyed people behind those faces are just as quick to defend their opinions or conclusions on any technical or philosophical aspect of bikes or of boats. 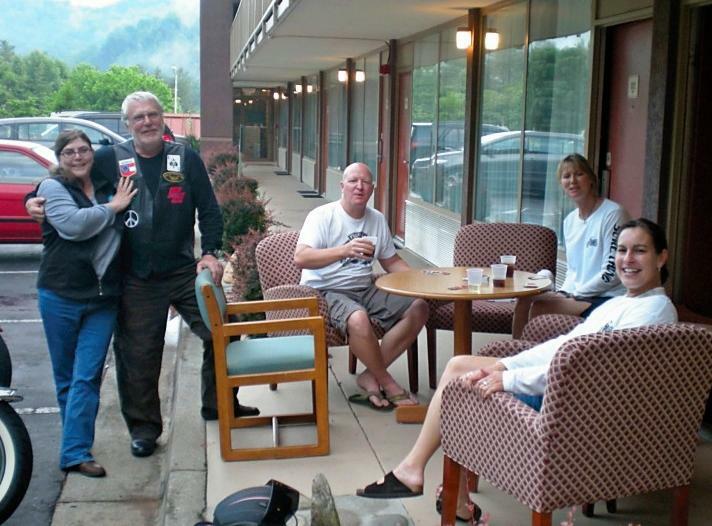 In biker bars the conversations are as focused, contentious, and frivolous as they are at any dockside watering hole. 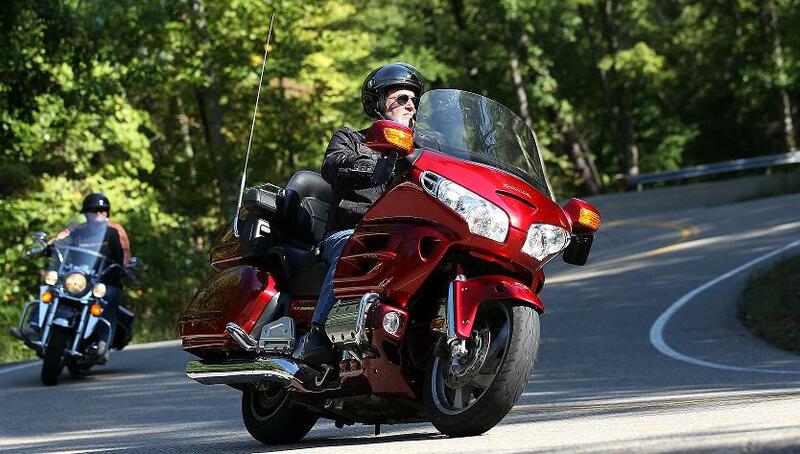 Delcia and I find smaller groups easier to enjoy… on and off the road. There’s always an undercurrent of competition in these first meetings, and it often persists for the lifetime of the relationship. Motorcyclists tend to develop strong commitments on a broad range of topics and values associated with riding. It is remarkably easy to elicit those assessments even when you’re not trying to. Not the least of these is the heartfelt proclamation of the absolute perfection of each rider’s chosen machine. But an equally effusive endorsement is readily on tap for his or her choice of gasoline, engine oil, tires, exhaust systems, on-board electronics (especially GPS models), headlight and taillight configurations, replacement seats, boots, jackets, pants, helmets, and concealed firearms. All right… let me confess… at this point subjective values and judgements take over. This is a blog, after all. And that means it’s my intellectual, emotional, spiritual, and political pulpit. It is not my purpose to offend or alienate anyone in these pages, but this one has the highest potential for doing so. I discovered as a sailor and confirmed as a biker that I am not a herding sort of animal. I do truly like other people, and I enjoy being with them… in limited, controlled circumstances. What I can’t abide is full time, long term congestion. Maybe it’s a lingering prejudice from my long, navy years of cramped shipboard living alternating with life in a crowded barracks. Anyway, I find that, no matter what the social setting, I need regular and generous doses of private time. 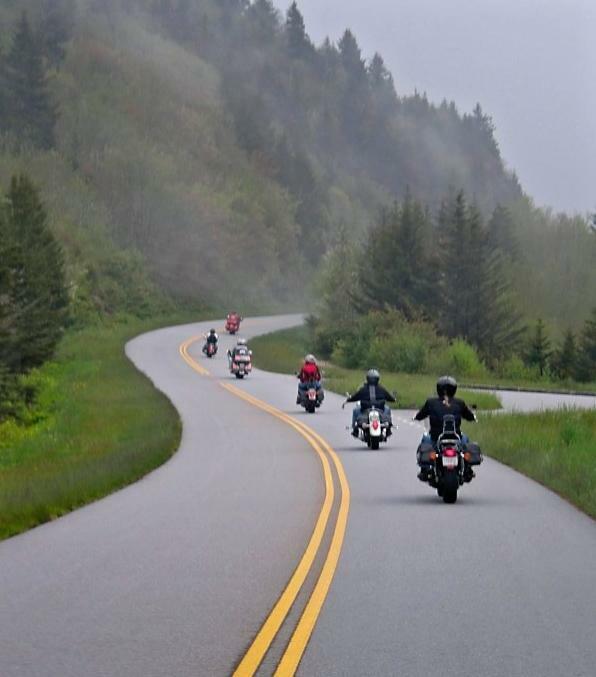 On the road, when you’re sharing a route and a routine with a herd of motorcyclists, there’s a close–almost incessant–connection among its members. You carve out a tiny piece of the limited road space, you breathe one another’s exhaust fumes, and you’re compelled to make continuous allowances for an endless variation of other styles… of riding and of living. Curiously, when I spent long periods among other sailors, I found I was more tolerant in this area. But then, when you sail in company with other boats, you still enjoy the benefits of being widely separated in the open, fresh air on the unlimited track of the sea, and you’re little bothered by constant interaction… until the next anchorage is reached and happy hour begins. The problem is this: for the most part, bikers don’t move on. They’re not from Australia or Chechnya or Norway; they’re from your own town or the one next door. And it doesn’t take you long to learn who and what they really are. And I’m sure they leap enthusiastically to similar unflattering assessments of me. I have yet to participate in a group ride, a gathering of bike enthusiasts to visit interesting places, in which I didn’t end the day with a vow never again to participate in such a chaotic and distracting endeavor. But, as I said, I’m not a herding sort of animal. So… to date I’ve been through two serious attempts toward fraternal biking, two separate months-long efforts to commune with my fellows. And both of them have failed. I’ve ridden my bike(s) with dozens of other enthusiasts over hundreds of miles, and I’m inclined toward two separate and insuperable observations. 1.) The rides are excruciating experiences. You can’t watch the road or the scenery because you’re too busy watching the bikes around you, to assure that you don’t crash into one of them. And 2.) When you get where you’re going, you have about as much in common with many of these people as you do with Sasquatch. The “Wheels Through Time” motorcycle museum, Maggie Valley, NC. You have probably deduced from my descriptions of riding with my wife that I find Delcia to be a like-minded and enjoyable road companion. There are some other names I can add to that list, friends with whom I have shared–and will continue to share–almost blissful days and weekends discovering new highways. They know who they are, and so do the others, the ones who ultimately fell victim to Ian’s infallible forecast. My range of comfort has settled at two to three companions to share the challenges of traffic and terrain… a total of five bikes at most. Delcia’s limit appears to be three or four. Beyond that, we find ourselves enduring rather than enjoying the passing miles. (“318 curves in 11 miles”) through the mountains of Tennessee, I did so with three new acquaintances I had met just that day at a rally in Pigeon Forge. The trio often rode together, and they shared my desire to separate from the rest of the rally and the potential demolition derby that could easily lie ahead. They overcame their original reluctance to my joining them (they actually put it to a vote), and our four-bike group was just big enough for sharing the thrill and the achievement but small enough to avoid being caught up in the pandemonium that can ensue when twenty or thirty riders bunch up through the curves and the testosterone levels get out of hand. Each of us knew that the other three had skipped the beers that could have made lunch more enjoyable but would have rendered the Dragon more dangerous, and we had no ambitions to show what speed demons we could be. Make no mistake. For all my hermit-like riding preferences, I hold a deep and abiding respect and appreciation for the larger, universal concept of motorcyclists as a community. I have seen or read about scores of instances in which bikers go out of their way to render aid and assistance to total strangers, simply because those strangers, too, are bikers. My own experiences with this sort of camaraderie and support are recounted on other pages in this blog (most notably at Saviors from the Chaos). But the biker family is no better or worse than any other, and just as your brother or sister would move heaven and earth to help you, aren’t you glad you don’t have to live with them? So it is with my cycle-siblings: I feel a true and secure affection for them as family members, but just as with my blood relations, the limited and controlled circumstances prescribed above are what keep the fondness flowing. Now, I’ll surely get some hate mail over this entry. I have known and liked many a rider whom I could see was thoroughly enamored of the herd-on-the-highway concept. And some readers of that mind will want to call me out on my antisocial attitude. But before they write that message, they should know that just as many readers are likely to admit their own appreciation for my sentiments. Among all of us our only major differences on this topic are in the simple matter of degree– how much close order drill is enough to satisfy the herd instinct? And when is enough simply too much? In the final analysis, of course, we have to recall the aptness of the very title of this blog. It does contain the rantings of a late-life biker, a man come to motorcycling long after he was set in his ways, both personally and socially. It’s likely that my independent streak would be far less pronounced if I had spent two or three decades riding with large groups over long distances. But I recently described my thesis for this page to a new acquaintance. He has ridden motorcycles for nearly fifty years, though he’s still younger than I am. We have never ridden together, he and I, yet he confessed that on his last large, group ride, he just dropped out of the formation. He wanted a little personal space, a little less community and a little more comfort. I’m glad he shared that bit of supportive, personal insight. Now I don’t feel so guilty or quite so much like one of those people Ian proclaimed us all to be… once you get to know us. I’m hesitant to reply because there is no way that my words will be as eloquent as yours but I must concur with your sentiments regarding large group riding. 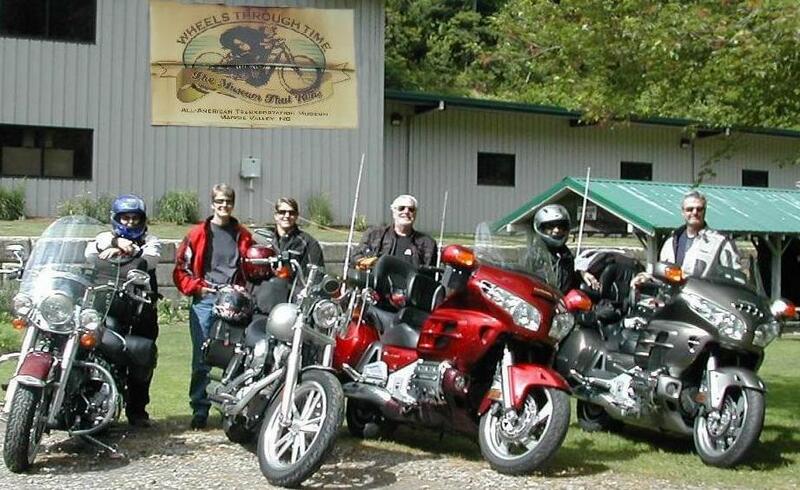 When I first became a re-entry rider after having a brief 20 year layoff I would often seek out internet groups in the hopes that I could tag along and experience new roads and destinations that I wouldn’t have know about or attempted on my own. After I purchased a GPS I was more willing to strike out on my own and found that I didn’t care much for the large groups anymore. Having one or two others can also be enjoyable as long as you all have the same riding temperament. I thoroughly enjoyed our ride this year and hope that it isn’t our last. Bang on, Paul. And such great writing! I share your opinions, appetite for and distaste of, riding in ‘herd’ formation. I recently completed a 1600 mile trip on my own and so enjoyed the freedom of stopping whenever I felt like it and being my own boss. But I think we’re both wired that way, needing our personal space at times. I’ve also ridden long-distance with two other friends I trust and it was also very enjoyable. And I’ve ridden in larger packs and in the huge charity ride herds too and enjoyed for them for what they are. So many perspectives! What you said about being a loner totally resonated with me, Paul. I grew up an only child, and most onlies need huge gobbets of space around them, both mentally and physically. My husband and I both were onlies, and we are forever allowing for space for each other. If I am at a gathering, there comes a point when I head for the balcony, or the kitchen or even a rest room, just to clear the air for myself. And I were a biker I would be doing single rides, maybe two-fers, but not much more. I can appreciate the space you and your wife leave around yourselves.